Stay in compliance with the your fire department and properly mount your fire extinguisher on the wall with wall mount brackets from Extinguisher Experts. Each kit includes a heavy duty powder coated steel bracket, metal drywall anchor, Phillips head screw and washer. Fits 2.5 to 5 pound ABC, BC, Purple K extinguishers, as well as some Halon, Halotron, and CO2 extinguishers that have slots in the head for fork style brackets. Brackets fit extinguishers from Amerex, Ansul Sentry, Badger, General and others. Extinguisher Experts makes it easy to install your brackets with simple hand tools. Simply use a Phillips head screwdriver or impact driver to install the zinc anchor into the wall, then use the same screwdriver to install the screw and washer through the bracket into the anchor. To install the bracket into a wooden stud or wall, simply skip the drywall anchor. The hardware included is designed to work with drywall or wood applications. Masonry or metal installations will require different fasteners. Click "Add to Cart" today and get your extinguishers installed properly. FITS SMALL FIRE EXTINGUISHERS: Fits 2.5 to 5 pound ABC, BC, and Purple K fire extinguishers with a slots in the head for fork style brackets. Fits extinguishers from Amerex, Ansul Sentry, Badger, General and more. 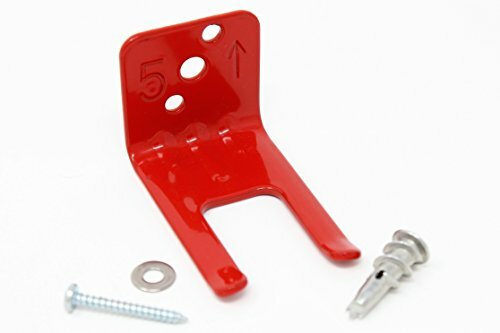 EASY TO INSTALL: You can install your extinguisher's mounting bracket to drywall or wood in minutes using simple hand tools. We include the correct heavy duty metal anchors to properly mount brackets into drywall. FIREFIGHTER'S CHOICE: As a professional firefighter and licensed fire extinguisher technician, I chose these parts based on years of experience seeing what works and what doesn't. CORRECT HARDWARE: No more brackets falling off the wall. These heavy duty metal anchors are the correct way to install a fire extinguisher hook into drywall. SATISFACTION GUARANTEED: We want you to be entirely satisfied with your purchase. If you have any issues or questions regarding your purchase, please feel free to reach out to us. If you have any questions about this product by Extinguisher Experts, contact us by completing and submitting the form below. If you are looking for a specif part number, please include it with your message.